Learn about the eye test that can detect changes in eye pressure long before a patient is aware of it. 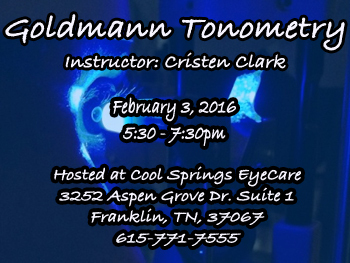 Goldmann applanation tonometry is the gold standard for measuring intraocular pressure. Including an overview of glaucoma, this is a hands-on teaching class. Clark, an ophthalmic educator since 2007, has over 10 years of clinical eye care experience. This workshop includes hands-on training of applanation tonometry. Every participant will have the chance to check pressures on a live patient! This course has been approved by the AOA Commission on Paraoptometric Certification (CPC) for three hours of continuing education credit. Students must attend both sessions to be eligible for credit. This class will introduce students to 13 of the most common chronic eye diseases. Students will learn about the clinical presentations, associated systemic conditions, usual courses of treatment and prognosis of each disease. This class is ideal for paraoptometric staff, newly hired or aspiring ophthalmic technicians, and healthcare workers wishing to learn more about chronic eye diseases. This course has been approved by the AOA Commission on Paraoptometric Certification (CPC) for 1 hour of continuing education credit. This is the first of our six-part Contact Lens Basics track. In this session we will discuss parameters of soft contact lenses including base curve, diameter, Dk/t and powers. Insertion and removal training techniques will be discussed to help new contact lens wearers learn how to wear and care for their contact lenses. Students will learn how to assess the fit of a soft spherical lens at the slit lamp looking for centration, edge alignment, post-blink movement and push-up test. All attendees will have the opportunity to look at soft spherical contact lenses on a patient in the exam room at the slit lamp. Come and learn how to better utilize and navigate Microsoft Excel in our two-hour workshop taught by Wendy Beam, MEd/HRD and Keisha Gilmore, MACC. Students are encouraged to bring a laptop with Excel installed. There will be equipment available at the facility to borrow if needed. Cost per attendee: $50 (includes laptop rental), $5 discount if student provides their own laptop for the class. This two-part course is designed to aid paraoptometric staff members in studying for the Certified Paraoptometric exam through the AOA/CPC. The CPO exam establishes a baseline level of knowledge and understanding for staff members working in an optometric practice. Ideal for those signed up to take the CPO Exam, this class is also a great introductory course for new members of the optometric practice team and an excellent review course for more seasoned members. 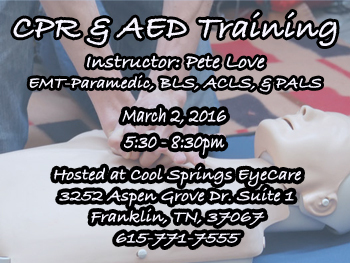 Includes: Both nights of instruction, refreshments, all handouts and materials from the class. This is the second of a two-part series covering the basics of refractometry for beginners. This session will include a 45 minute lecture expanding on more advanced topics, with a short break followed by hands-on practice to demonstrate skills learned in the lecture. Includes: Lecture, learning materials, hands-on training. This is the first of a two-part series covering the basics of refractometry for beginners. The first session will be composed of a 45-minute lecture, with a short break followed by a hands-on practice session where all attendees will be able to demonstrate the skills covered in the lecture. All attendees will be given a written test at the end of the course which takes no longer than 15 minutes to complete. Includes: Training materials, mannequin use, written test, and certification card. All attendees will be given a link to an online assessment at the end of the course. Students that submit a passing assessment within two weeks of course completion will receive their Contact Lens Certification from the Tiger Institute for Cooperative Learning. Competent in insertion and removal training and patient education for soft contact lenses, RGP's and hybrid lenses. This workshop combined hands-on optometric training with individual attention and instruction by Dr. Jeffrey Kegarise. Intended for future optometry students, this class was also be ideal for anyone considering a career in eye care. Students were introduced to many of the diagnostic tests used by optometrists, learned about many of the day-to-day decisions and struggles that face optometrists, and had the opportunity to ask questions that they may have about their future careers.